Why not book Slappingskins for your birthday party or event? Slappingskins has run workshops at birthday parties for young children and adult parties alike. 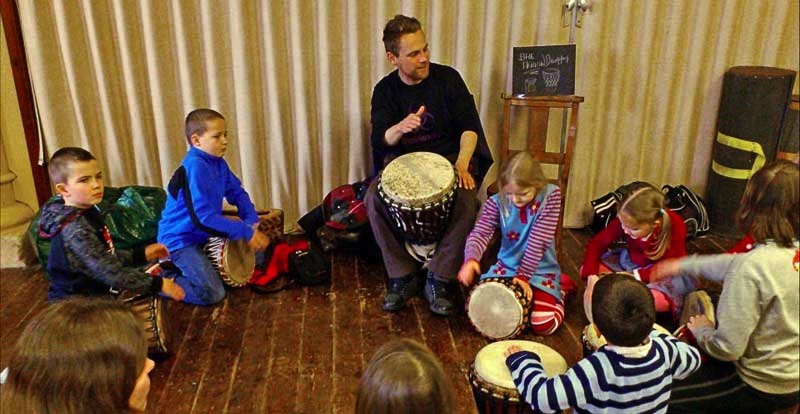 Slappingskins will turn up at a venue of your choice and bring a wonderful selection of drums and percussion to keep your little ones entertained for a couple of hours. The party is usually split into two sessions: The first session will last up to an hour where everyone will have a drum or percussion piece and will have a part to play in a group rhythm and an opportunity to play the maestro and conduct the rest of the party through some interesting dynamic drumming. After the first hour we usually break for snacks and drinks then we kick off with another session of drumming which will focus on fun games and activities. There will be an opportunity for the children to make up their own rhythms and drum along with their friends and family. Scout halls, barns, front rooms, gardens, marquees and tipis have all been used as venues for successful birthday parties. Slappingskins can be flexible in tailoring a party to suit your needs. Slappingskins can come and help make your party go off with a bang! Slappingskins has run workshop style parties where newcomers can come and have a go on the drums with some informal tuition and then let go a little and play together in a drum circle style arrangement where guests can join in as and when they fancy on a drum, a rattle, a shaker, a bell or another unusual piece of percussion. Slappingskins can tailor the session to suit your needs and can provide a wonderful array of percussion instruments from around the world including some homemade log drums and other interesting pieces. Contact Aaron for more info on birthday parties drums. What a great idea for a birthday party… Everyone had a truly great time!